Mary Clark, Professor of Law at Washington College of Law and Interim Dean of Academic Affairs and Senior Vice Provost at American University, leads a discussion of Family Limitation by Margaret Sanger. Margaret Sanger is currently considered a "single author." If one or more works are by a distinct, homonymous authors, go ahead and split the author. 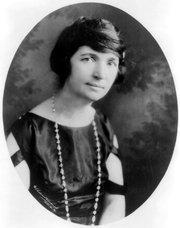 Margaret Sanger is composed of 3 names. You can examine and separate out names.